EC Why Is The Market Unimpressed With Bank Earnings? The market appears to be painting JPMorgan (JPM) with the same brush as Wells Fargo (WFC) and Citigroup (C) after their quarterly releases, but the fact is that JPMorgan’s report represented all around strength and offers useful read-throughs for what to expect from pure-play investment banks, trust banks and regional operators in the coming days. It isn’t hard to appreciate the market’s negative reaction to the Wells and Citi reports, but the post-release weakness in JPMorgan shares is likely nothing more than a sell-the-news type of mindset. There is likely a comparability ground for the market’s lack of appreciation for these results as well. Two new accounting rules took effect this quarter, one dealing with revenue recognition on the asset management side and the other dealing with the valuation of ‘hard-to-price’ securities on the balance sheets. The earnings releases specify the impact of these rule changes, but they add to the ‘noise’ around these results. We recently made a contrarian call on Wells by adding it to the Zacks Focus List, our core thesis being that the worst was already priced in the stock and the market will slowly be coming around to appreciating this fact. The internals of the Wells report indicate that the estimate revisions trend for the current and coming quarters will likely be negative, in contrast to what can reasonably be expected for JPMorgan and Citi, which will keep the stock under pressure. This means that our Focus List call on Wells may have been premature, with the stock’s underperformance relative to its peers likely to persist a lot longer than we envisaged. The chart below shows the year-to-date performance comparison Citi, JPMorgan, Wells and the S&P 500 index. Wells’ net interest margin, the difference between what it pays depositors and what it charges borrowers, was flat from the preceding quarter and down from the year-earlier level. Growth in the bank’s loan portfolio and expenses also compare unfavorably with its peers. Wells’ loan portfolio was down from the year-earlier level while the same at Citi and JPMorgan were up +7% and 8%, respectively. Citi’s results failed to impress as well, with the bank’s trading business, particularly the fixed income desk, failed to fully capitalize on the all-around volatility in Q1. Unlike JPMorgan’s +8% revenue growth in the fixed income, currencies and commodities or FICC business, Citi’s FICC revenue was down -7% in Q1. We now have Q1 results from five of the 98 Finance sector companies in the S&P 500 index. Keep in mind however that these five companies account for 23.7% of the sector’s total market capitalization in the index. Total earnings for these 5 Finance companies are up +20.4% from the same period last year on +6.9% higher revenue growth, with 100% beating EPS estimates and 60% beating revenue estimates. The comparison charts below put the results thus far in a historical context. As you can see in the chart above, the sector’s growth picture is materially tracking above what we have been seeing in recent years, reflecting the combined effect of tax cuts, higher interest rates and more ‘normal’ capital markets activity. The right-hand side chart shows that earnings surprises are very numerous, but keep in mind that we are talking about 5 earnings reports at this stage. 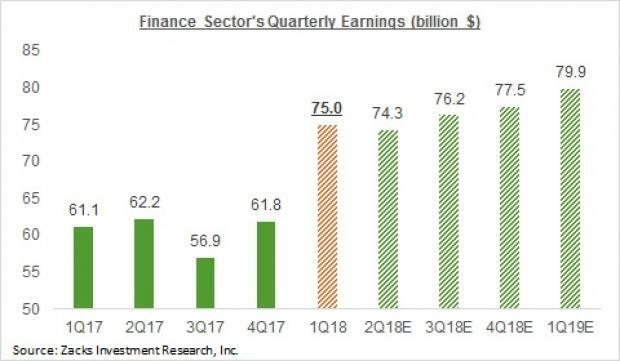 For the quarter as a whole, total Finance sector earnings are expected to be up +22.7% from the same period last year on +4.7% higher revenues. This would follow +0.6% earnings growth in 2017 Q4 on +4% higher revenues. The sector’s earnings growth momentum is expected to continue in the coming quarters as well, as the chart below shows. Please note that the sector’s strong growth in Q1 and beyond isn’t a function of easy comparisons, but actual growth. You can see this in the dollar value of total sector earnings in the chart below. The table below shows the sector’s Q1 earnings growth expectations at the medium-industry level contrasted with estimates for the following four quarters and actual results for the preceding four periods. Driving this improved earnings picture for the banks and other finance companies is the combination of lower taxes and higher interest rates. The strong momentum we saw in the preceding earnings season is expected to continue this reporting cycle as well, with total earnings for the S&P 500 index expected to be up +16.6% from the same period last year on +7.5% higher revenues. 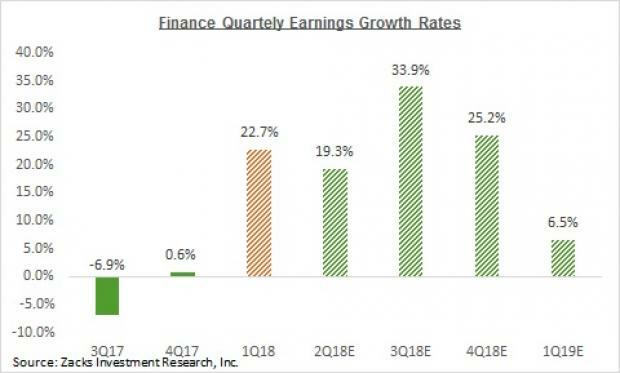 This would follow the +13.4% earnings growth on +8.6% revenue growth in the 2017 Q4 earnings season, the best quarterly performance in more than 6 years. There were two aspects of the preceding earning season that really stood out and put that reporting cycle in a category of its own; we will be looking to what extent these two aspect s get repeated this earnings season. These two standout features of the 2017 Q4 earnings season were the very strong momentum on the revenue front and impressive turnaround on the estimate revisions front. The revenue momentum likely reflected a combination of the synchronized global growth environment and a favorable foreign exchange backdrop. With both of those factors still very much in play in Q1 as well, we can reasonably expect to see the revenue momentum trend continue this earnings season as well. The story about trends in 2018 Q1 estimate revisions is better told by the chart below. Finally Time To Buy Stock Market Volatility? EC HH Fake Risk, Fake Return?